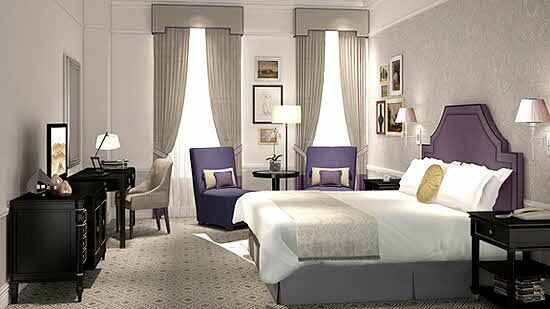 The Langham Hotel in London is as close to perfect as you can get. A 5-star property that could easily be given 6 stars, my recent experience there... from the facilities to the staff... was nothing short of exquisite. And I don’t use such words frivolously. 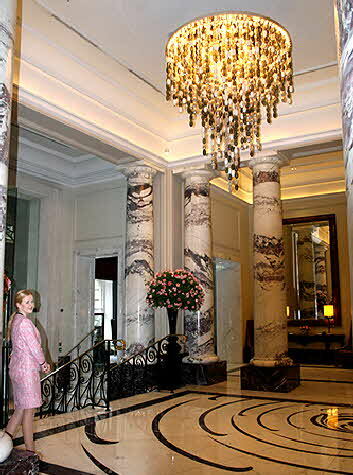 Located on the West End, close to the shopping of Oxford Street, The Langham’s doorman charmed me immediately upon my arrival and marked my bags so that they didn’t need to follow me into the lobby. The Regent Wing rooms are done in traditional taupe décor, but the bold violet color of the velvet chairs and bed headboard lend a touch of flash. This shade is repeated in the seating of Artesian, the hotel’s cocktail bar. I loved the damask bedding more than any hotel I have ever experienced; it felt wonderful against my skin. Besides a couch and coffee table at the foot of the bed, which faced the television, the minibar contained a drawer with glassware and china for tea and coffee. A selection of teas was included, along with a Nespresso machine. The bath contained fresh orchids and was designed with green marble on the countertop, floor, and detail on the tub. There was a separate shower and a bathroom scale. Unlike many luxury hotels in London, an iron and ironing board were included in the room, as well as a particularly large safe. I always appreciate a safe that’s big enough to hold my ample laptop and camera equipment. Also, WiFi is free, and there were complimentary bottles of water provided. Of course, the room also had a fine robe, slippers, and hair dryer. One of the nice details was a pink and gold box that contained stationery and a pink and gold writing pen. The Langham has 380 rooms and suites, as well as conference facilities and a Grand Ballroom that holds 375. There is a Chuan Spa and Chuan Health Club with equipment, salt sauna, steam rooms, and swimming pool. More even than the amenities, I was impressed by the staff â€“ each of whom addressed me by name whenever I called with a request... and also by the breakfast in the hotel’s Roux on The Landau restaurant. I guess I shouldn’t be surprised since it’s overseen by father and son Michelin chefs Albert and Michel Roux, Jr. A small buffet included cold meats, fruits, breads, and pastries, but you could also order a full English breakfast. Everything was prepared and presented with great attention to detail and quality. Even the breads and fruits were especially fine, and the service was impeccable. Breakfast is also served in The Langham Club lounge. Club privileges get you butler services and free champagne as well. 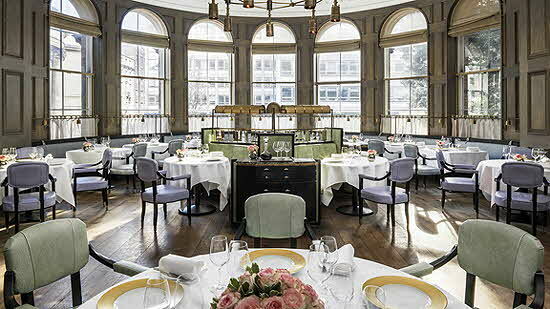 Besides Roux on The Landau, The Langham has The Palm Court on the property, where afternoon high tea was served for the first time in the UK in 1865. 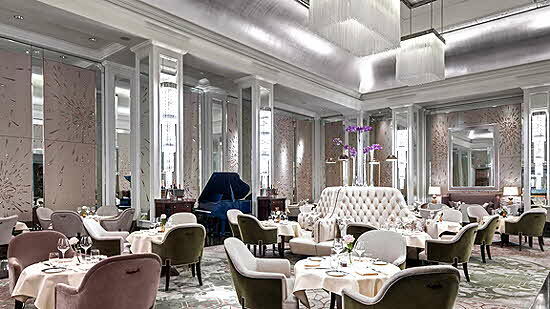 In fact, The Langham has been famous for its high tea since then and frequently wins “Best Afternoon Tea”� awards. The Palm Court turns into a jazz lounge on Friday and Saturday nights. 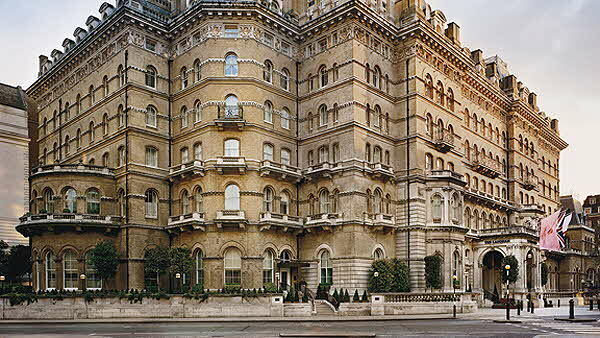 The Langham has quite a history and claims to be London’s first “Grand Hotel”. The building endured bomb damage during World War II and is the first hotel in London to install air conditioning. Some people even say the property is haunted, although I didn’t see any evidence of that during my stay. One of the purported ghosts is a German prince who, in a lovesick state, hurled himself off the balcony of his room. There was a famous meeting there in 1889 between Oscar Wilde, Arthur Conan Doyle, and editor Joseph Marshall Stoddart. Doyle mentioned the hotel in some of his Sherlock Holmes stories, and the property has been used in films, including the James Bond movie “Golden Eye”.� Some of The Langham’s other distinguished guests over the years have included Mark Twain, Napoleon III, Antonin Dvorak, Arturo Toscanini, Winston Churchill, Charles de Gaulle, Noel Coward, Emperor Haile Selassie of Ethiopia, and Princess Diana. It’s one thing to feel privileged to stay in a hotel with such a history, but it’s another to have it live up to its reputation 100%. If this property is any indication of the quality of Langham Hotels elsewhere in the world, I hope to experience another one before long. © May 2016 LuxuryWeb Magazine. All rights reserved.